The week will kick off with an Earth Days book discussion at the Vermillion Public Library on Saturday, April 20. 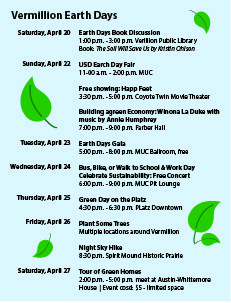 One event that’s returning from previous Earth Day celebrations is the USD Earth Day Fair, which will take place on Monday, April 22 in the MUC pit. “Students will be able to network with 15 individuals and organizations from all different parts of sustainability,” Ireland said. In addition to the Fair, the sustainability club will host an Earth Day gala on Tuesday and a free Beard concert on Wednesday. “(At the gala) there will be free food, three different speakers, games, a silent auction and a different atmosphere for people to talk about sustainability,” Ireland said. Meghann Jarchow, the chair of the Department of Sustainability and Environment, said the week is a community-wide series of events. Holly Black, a freshman medical biology and sustainability major, said she’s looking forward to engaging with the community through the events. “I think that the best way to approach sustainable topics is in a community environment, so I think this is a really good opportunity to promote sustainability in general in a really fun way,” Black said. Ireland said she thinks the week of events will help people better understand what sustainability is. Other events include a free showing of the movie Happy Feet, a “Building a Green Economy: Indigenous Strategies for a Sustainable Future” lecture and a night sky hike at Spirit Mound. To find the full list of events, go to the Greening Vermillion website.